Domestic convenience coupled with modern comfort such as wireless high speed internet connectivity! Welcome! We are located conveniently between two of Alabama's largest metropolitan areas at exit 89 on Interstate 20/59. The Greystone Inn and Suites offers the best alternative to the hectic city scene by providing a tranquil and relaxing atmosphere. The peaceful comfort of the country welcomes the leisure traveler seeking an overnight stay at a hotel with all the right touches, while providing quick and easy access to many of Alabama's noteworthy attractions. Meeting spaces able to accommodate groups up to 50 with many layouts and style options. The hotel was very nice. It was clean, the bed was comfortable, the TV had lots of available channels and the wifi worked great. I loved the makeup mirror in the bathroom. Fresh cookies were in the lobby and water and soda in the room. Will definitely stay again given the opportunity. I recommend this hotel to anyone who is looking for a great hotel at a reasonable price. There is little I can add that hasn't been stated in the other reviews... It is a true diamond! Wish I could stay longer! The staff is so accommodating. Clean, big, fitness center, breakfast and a great price. Will stop here again and again. Wish they were all like this! We reserved this hotel based solely on its reviews. Let me say, we were not disappointed. The room was spacious and very well appointed. The staff is friendly and the price is excellent. Welcome! We are located conveniently between two of Alabama's largest metropolitan areas at exit 89 on Interstate 20/59. 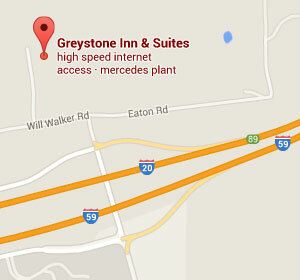 The Greystone Inn and Suites offers the best alternative to the hectic city scene. 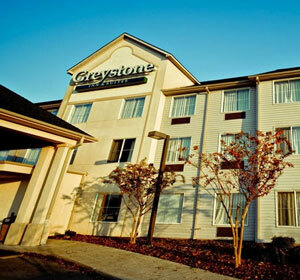 The Greystone Inn & Suites offers generously sized and beautifully appointed guestrooms. 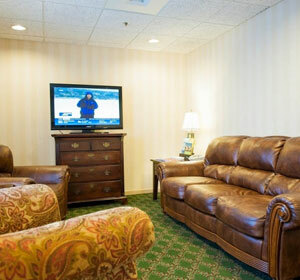 A variety of amenities ensure that each stay is a pleasant and comfortable one.